Eating whole, nutritious foods, reducing processed foods and cutting sugar are crucial steps to weight loss. Feeding your body the right nutrients rather than stuffing it with “empty” calories will not only help you lose unwanted pounds, it’s also a key ingredient for living a long and healthy life. Many people who are overweight are actually malnourished. Recent research also indicates that if you are vitamin D deficient, if you optimize your vitamin D, you may lose weight more easily. The term “superfood” was coined in 2004 by Dr. Steven Pratt, author of Superfoods Rx: Fourteen Foods That Will Change Your Life. 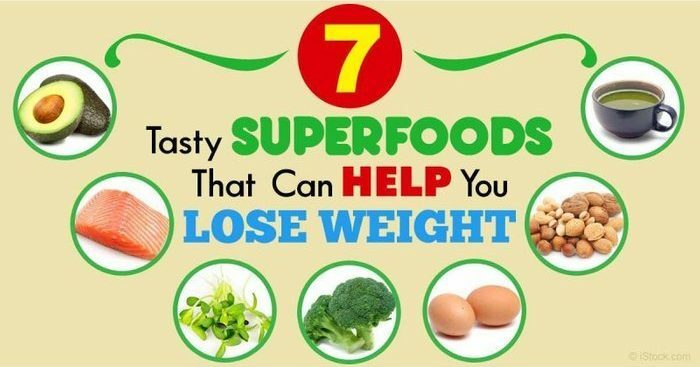 More recently, Health magazine listed dozens of slimming superfoods. 1. Avocado – Avocados contain heart-healthy monounsaturated fat that is easily burned for energy, while also being low in fructose. Research has found that avocados are helpful for regulating blood sugar levels. This is an important benefit for most people, considering that one in four American are either diabetic or pre-diabetic. Avocados also help to improve lipid profiles by naturally lowering LDL cholesterol and triglycerides, while raising beneficial HDL cholesterol. Avocados are high in potassium, which is another bonus. 2. Wild-Caught Alaskan Salmon – Another high-fat food to eat more of is Alaskan wild caught salmon. It’s an excellent source of essential animal-based omega-3 fats (EPA and DHA), astaxanthin, and other antioxidants, along with high-quality protein. It also scores well in terms of mercury contamination, which is a concern when adding more fish to your diet. Try to avoid farmed salmon, which have less nutrition and more toxins. There will also soon be GMO salmon on the market. If you buy wild caught, it won’t be GMO. 3. Sunflower Sprouts – Sprouts should not be overlooked. Sprouts have a superior nutritional profile and are really easy to grow, even if you live in an apartment. Sprouts can contain up to 30 times the nutrition of organic vegetables grown in your own garden. Both the quality of the protein and the fiber content of beans, nuts, seeds and grains improve when sprouted. The content of vitamins and essential fatty acids also increase dramatically during the sprouting process. Sunflower seed and pea sprouts tend to top the list of all the seeds that you can sprout. 4. Broccoli and Broccoli Sprouts – Broccoli is one of the most valuable health-promoting foods around. Broccoli can significantly improve blood pressure, kidney function and gut health. Broccoli sprouts may be an even better option, as they pack more nutrition. According to researchers at Johns Hopkins University, a mere five grams of broccoli sprouts contain concentrations of the compound glucoraphanin equal to that found in 150 grams of mature broccoli. One of the “secrets” behind broccoli’s ability to help you lose weight is the fact that they’re high in a fiber that nourish the beneficial bacteria in your gut. 5. Organic Pastured Eggs – Eggs are an important part of a healthy diet, for a number of reasons. Not only do they contain high-quality protein and fat, they also contain the valuable antioxidants lutein and zeaxanthin, which can help prevent age-related macular degeneration, which is the most common cause of blindness. Pastured eggs come from hens that roam freely outdoors on a pasture where they can forage for their natural diet, which includes seeds, green plants, insects and worms. 6. Raw Nuts – Raw nuts can help you curb your appetite and boost weight loss. They have also been linked to a boost in longevity. Macadamia and pecans provide the highest amount of healthy fat while being on the lower end in terms of carbs and protein. Pine nuts are also close contenders. 7. Green Tea – Green tea is one of the healthiest beverages that you can drink. Green tea is packed with vitamins A, D, E, C, B, B5, H and K. Green tea also contains beneficial minerals such as manganese, zinc, chromium and selenium. Green tea is beneficial for your brain and heart, boosts metabolism, has anti-cancer properties and can benefit those who are insulin resistant and/or overweight. Green tea can be contaminated with a variety of toxins, including fluoride and lead, both of which are readily absorbed from the soil. Areas with excessive industrial pollution, such as China, where nearly 90% of the world’s green tea is produced, may contain substantial amounts of lead. Japanese teas tend to be less contaminated and are generally preferred for that reason.